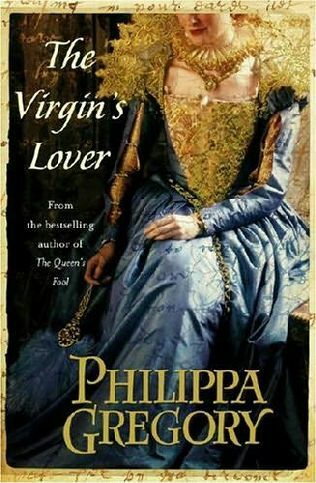 The Virgin’s Lover is the third in a series of books about the Tudor monarchs. It follows on from the success of Gregory’s The Other Boleyn Girl detailing the relationship between Anne Boleyn and her sister Mary. This novel deals Anne’s daughter Elizabeth I, the Virgin Queen and her ‘lover’ Robert Dudley. Breaking away from the classroom history lesson, Gregory delivers a story filled with real characters and a vivid insight into 16th century politics. The year is 1558 and twenty-five year old Elizabeth I has been crowned Queen of England. For her, this is the fruit of years of uncertainty and neglect and her moment to finally rise to glory. For her followers it is their chance to redeem themselves after the persecution of the old queen. Among them is Robert Dudley, son of a disgraced courtier. Dudley is handsome, captivating, sexually alluring to the young Queen…and married. In the countryside, Dudley’s wife Amy awaits him with all the love and adoration of a newly married bride. She desires above all a quiet country life with him as her constant companion. Far from returning her love, Dudley soon begins to see her as a nuisance and burden. As his intimacy with the Queen grows, he begins to dream about the ultimate prize – being the husband of Elizabeth and King of England. Everyone learns about Elizabeth I at school, but what we don’t learn is the person behind the name. Philippa Gregory brings the queen to life, and brings a whole host of interesting characters along with her. The Virgin’s Lover is definitely not a history book, although the main characters are all real. It is a re-imagining of a time long past, building a rich background to fit the facts. The characterization throughout is splendid – Gregory shows the good, the bad, and the ugly of all her players. Elizabeth is a complicated mix of naivety, ruthlessness, youth and political animal. She is realistically shown as being torn between her love for an unsuitable man, and her destiny to be a powerful Queen. By far, she is the most fascinating character in the book. Her rival Amy Dudley comes in a poor second. Although the loving yet betrayed wife should get some automatic sympathy, Amy becomes more irritating as the story progresses. This is partly due to her constant bewailing and partly because the reader wishes she would eventually punch her unfaithful husband in the face. The Virgin’s Lover has a great political edge to it. The time spent on Amy’s perspective can feel dragged on due to the lack of action. However, the action occurring back at court is so fraught with sexual and political tension that the reader is compelled to keep reading on. This book is especially interesting when you consider that Elizabethan England was still very much a man’s world, and the new queen was constantly threatened by opposing political factions. At the centre of the story is the question of her marriage – who will be her consort and the ‘real’ ruler of England? Mild-mannered professor of languages, William Race, gets made an offer he can’t refuse when the US Army comes knocking at his door. He is given the chance to translate an ancient and zealously guarded text that tells the location of an Incan temple. Within that temple is an ancient idol with the potential destructive power of a thousand nuclear weapons. The Army wants that idol very badly. Unfortunately, they aren’t the only ones after it. Race is drawn into the story of the Incan prince Renco and his mission to protect the mighty idol from the Spanish Conquistadors. As the situation in Peru becomes more and more dangerous, Race must rely on Renco’s story in order to survive. Surrounded by enemies who want the idol for their own purposes, Race must cast off the professor and become the unlikely hero. If a book could be a person, this one would be Indiana Jones but with the Terminator’s arsenal of weapons. Although well written, Temple is hardly high literature. It has a boyish, video game feel to it that makes it incredibly entertaining but not incredibly satisfying. In fact, I could easily see this becoming a successful box office hit à la Raiders of the Lost Ark. Reilly tries hard to make the characters multi-faceted and dynamic, but doesn’t approach the fluidity and realism of Dan Brown (whose character Robert Langdon is a near-composite of William Race, although Temple precedes Angels and Demons). Reilly also links the past and present to make a parallel between the modern professor and the Incan prince. At times, the intense action and incredible amount of violence take away from the actual story (hence the video game feel) but the interweaving of the two stories is skillfully done. A definite plus of this story is its unpredictability – there are more twists and turns than Space Mountain. It makes it a book that is hard to put down. Read this if you enjoy the action, adventure type of novels (and movies!) or if you’re a Dan Brown fan. 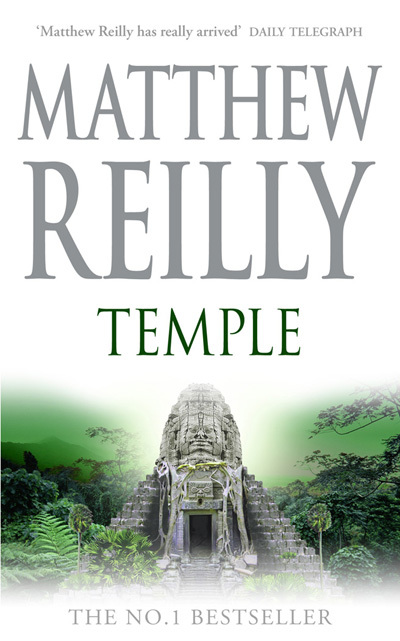 Matthew Reilly is known for writing fast-paced adventure novels, and Temple is no exception. Don’t be put off by the thickness of the book – it’ll be so gripping that you’ll be asking for more. If this isn’t your thing, I encourage you to try something new and just read the first chapter. Trust me, you won’t be disappointed.